This book clearly illustrates how GIS technology is currently being used in Sub-Saharan Africa to improve living conditions. Redlands, California—The Sub-Saharan Africa Map Book, published by Esri Press, includes a collection of maps analyzing the region's major social, economic, and environmental issues. In the foreword to the book, Esri president Jack Dangermond writes, "Our world is in a constant state of change, with many regions facing particularly challenging problems. In Africa, the world's second-largest and second-most-populous continent, there are a number of interrelated issues spread across more than 50 countries. Economic instability, social conflicts, spiraling populations, disease, famine, loss of biodiversity, and the effects of global warming are of paramount concern." The Sub-Saharan Africa Map Book clearly illustrates how GIS technology is currently being used to improve these conditions. Map titles include, "Forecasting Climatic Variation Parameters for Nigeria," "Biodiversity Conservation Planning," "World Heritage Fund Sites in Africa," "Wetlands Maps and Governance Measures of Rwanda," and "Mapping Humanitarian Aid for Displaced People and Refugees along the Ivory Coast." As these maps show, GIS technology is an integral tool for change—a platform for sharing information and data—that enables researchers, planners, and communities to work together to build a sustainable future. 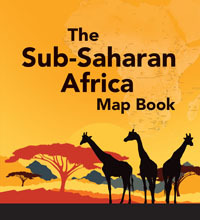 The Sub-Saharan Africa Map Book (ISBN: 9781589483385, 96 pages, US$24.95) is available at online retailers worldwide, at esri.com/esripress, or by calling 1-800-447-9778. Outside the United States, visit esri.com/esripressorders for complete ordering options or visit esri.com/distributors to contact your local Esri distributor. Interested retailers can contact Esri Press book distributor Ingram Publisher Services.